It’s the most important room in any home, so a kitchen must be practical, add value to the home, be aesthetically pleasing and fit in with the rest of your home. 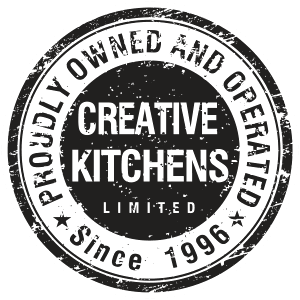 As one of Auckland’s best kitchen specialists and kitchen design specialists, Creative Kitchens Ltd has been supplying and fitting kitchens for new homes, renovation projects, apartments, hotels and commercial environments since 1996. Together with our team of highly skilled craftsmen, we design and manufacture kitchens in our own factory. We also provide creative, custom bathroom cabinetry design and installation. The design process requires careful thought and consideration in co-operation with you and, although we prefer to visit your home to get a feel for your specific needs, we can work off plans. Our CAD system presents you with 3D images of your new kitchen within the context of your own home. Visit our showroom, located at 30c Kerwyn Avenue, East Tamaki, Auckland, and talk to our team about your next kitchen design and kitchen renovation project. Our business is established by consistently maintaining high standards. 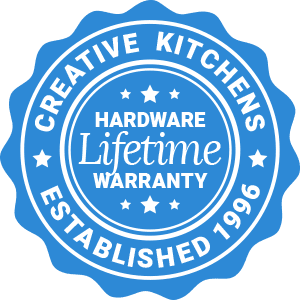 We provide a 10 year warranty on all workmanship and a lifetime guarantee on our quality hinges and hardware. Our goal is your total satisfaction and the opportunity to provide you with customer service and care beyond your expectations. You are investing in a kitchen for the next 15 years: a small cost premium spread over this time is a negligible cost per year. Once your new kitchen is installed it is very hard to modify. Will it meet your future needs? Will it work with possible future additions to your family? Quality is important (we offer a 10 year guarantee). We use quality European hardware in our kitchens. Our fully computer programmed automated machining is accurate to 0.5mm. Consider the following – Quality; On Time Delivery; Price: If you could only have 2 of 3 which one would you sacrifice? We guarantee delivery – if you provide 7 days notice of your install date. Please note changes to delivery within this period will negate this offer. We understand that installing a new kitchen involves a number of other trades. This guarantee will ensure you can confidently book the plumber, electrician etc. and get back to normal living in your new kitchen as soon as possible. We are good at what we do. Established in 1996, we have many years of experience in manufacturing and installing kitchens – well over a 1000 in this time. From our experience, the cheapest price is seldom the best price. Many home owners complain of a lack of bench space. Does your kitchen design provide maximum bench area? Is it good usable space? Does your kitchen give you the work triangle? You need to enjoy working in your kitchen.